>> Photo DVD Maker crashes upon starting up. An error message reads "The Photo DVD Maker program has stopped working". >> Photo DVD Maker crashes. The error message reads "Error while unpacking program, Code 2. Please report this to author." >> Photo DVD Maker crashes when you add photos to the program. Please try the following solutions to fix the photo slideshow program crash problem. Some times the updates of your Windows or security software will break down the way Photo DVD Maker works. Or the program files of Photo DVD Maker could be corrupted due to unknown operations or installation of other programs. In this case, please download a new copy of setup file from our website to reinstall Photo DVD Maker. Especially those who get the "Error while unpacking program, Code 2. Please report this to author" message, should use this solution to solve problem. Photo DVD Maker requires Adobe Flash Player OCX to render some effects. If the .ocx file is missing, Photo DVD Maker possibly will crash when you open it or add photos to it. It's not unusual to see many programs stop working in Vista systems. The problem is caused by DEP, or Data Execution Prevention. DEP will block many goodwares from starting up by mistake. Sometimes Photo DVD Maker becomes the victim. However, you can try turn off DEP for Photo DVD Maker. 4. 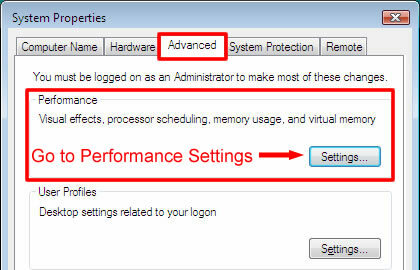 Now you are prompted to the "Performance Options" dialogue window. 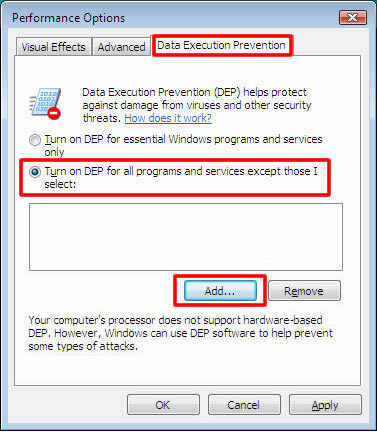 Click the "Data Execution Prevention" tab, and then select the option "Turn on DEP for all programs and services except those I select". And then click the "Add..." button to add Photo DVD Maker to the list. Find the executable file DVDPhotoMaker.exe, and then click Open to add it to the list. Right click on the DVDPhotoMaker.exe file, click "Properties" from the pop-up menu, select "Compatibility" tab, check the "Run this program in compatibility mode for:" option, select "Windows XP", and then click the "OK" button to save the setting. Then run the program to have a try. Some other slideshow software or other programs that adopt similar engines might conflict with Photo DVD Maker. If you have installed Roxio PhotoShow, DVD Photo Slideshow or other programs that could be the conflict items, please uninstall them for the time being during which you may use Photo DVD Maker without hassles.